The furniture has arrived, the boxes are unpacked, the holidays are almost behind us and so I'm just about ready to start dissecting again. RSS was kind enough to donate an interesting pair of coats (thank you, RSS) but before we get into those, I wanted to point something out. When I flipped the collar on one of them, something was not right- the was some curious stitching around the collar which was evidence of an alteration. Not uncommon. 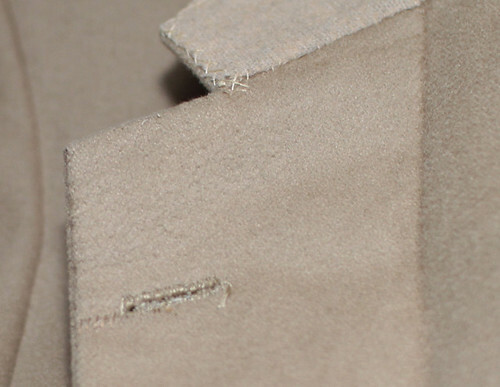 But then I saw a few little stitches near the buttonhole on the back of the lapel. Hmm. 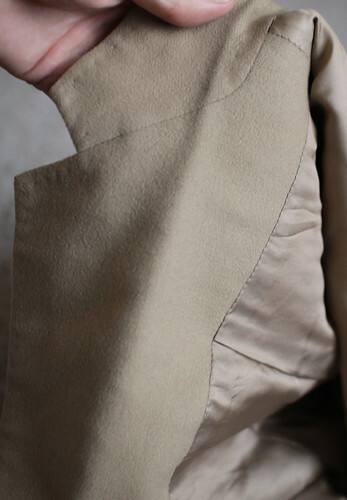 There was a slit next to the buttonhole that had been carefully closed up, as if the lapel had been narrowed by a tailor, but there was no visible evidence of any alteration from the other side of the lapel. The right was narrowed by simply trimming the edge, but the left had a dart taken out of the facing which narrowed it and maintained the position of the original slit. The buttonhole could then be reworked. 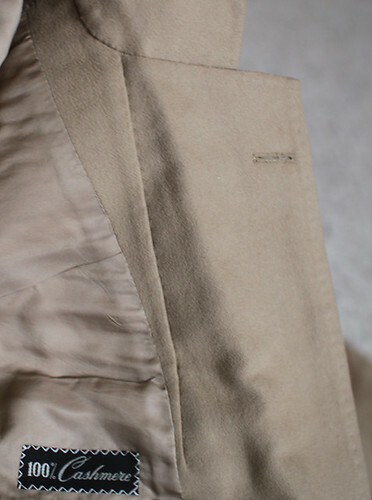 Of course, the collar had to be removed and narrowed as well, the edges of the lapel had to be sewn up by hand, and the collar redrawn by hand, and a perfect match of silk thread had to be found for the buttonhole and pick stitching. Not an easy (or cheap) alteration, but when well done, as it was in this case, would be virtually impossible to spot by the casual observer. That is really interesting. I am confused at why I only see one buttonhole. Are there more further down on the front? Thanks. I guess the style of jacket (a buttonhole on the lapel) is unfamiliar to me. A man's jacket typically has a buttonhole in the lapel to place a flower; the term boutonnier (sp?) comes from the french word boutonnière, which means buttonhole. even on new year's eve mr d... relentless! Hi Jeffery, nice to read you're settling well. Wish you a happy new year, in a whole new place. And what an interesting post for the last one of the year ! Welcome home. USA's gain. I look forward to reading your new posts. Hey Jeffery! Welcome back and Happy New Year! Welcome to the US. Glad to have you with us. End of the 70's decade, lapels trended narrow. Some men followed by wanting their lapels narrowed. Favorite method became cutting a dart under the lapel on the chest like your hammer dart from a previous post. Worked well, especially if the cloth had a pattern or a plaid or if the lapel buttonhole was cut thru. inspirational photos. Thank you for making the information available.